Today may just be my last post talking about Stupid. I'm undecided. One of my coworkers came to me recently telling me how she had clocked in, then disappeared for three hours. Only the lady who does all her work for her knew where she was and she ain't talking. I immediately got pissed (natch) and went to storm off and tell the boss. But my coworker got mad and said don't you dare tell. She said it will all be revealed or some sh*t like that. How is it going to be revealed if no one tells? Anyway, I walked away saying don't tell me these things anymore. It infuriates me how much work I do and how little she does. I presented this notion to my Facebook group as a morals question. Should I or shouldn't I? Seems the general consensus was I should not. That bosses don't like to hear from whiny, complaining employees anymore than they like people who do no work. But it's not up to me to police my coworkers. Somewhere along the line, I forgot this. I used to keep my head down, do my work and leave without getting involved in the drama. I don't quite recall when I stopped doing that. I appreciated the advice my groupies gave and have decided that I will go back to minding my own business and doing my job to the best of my abilities. One thing I do know however? That lady who does all Stupid's work is retiring June 19. At least that's what she's saying at the moment. She's been retired and come back and then said she's re-retiring for a very long time now. What I do know is that if she really does leave this time? Stupid is finally going to have to tow the line for a job she doesn't even know how to do. I am secretly thrilled at the notion of seeing her finally not be coddled any more. Oh and that meeting I told you about? Never happened. Seems the bosses don't want to hear them whine either! So I may still tell you readers my Stupid stories as I know a lot of you love them, but I will no longer get involved in her day to day NON activity. Now let's get to this. Here is the silly bottle shot. 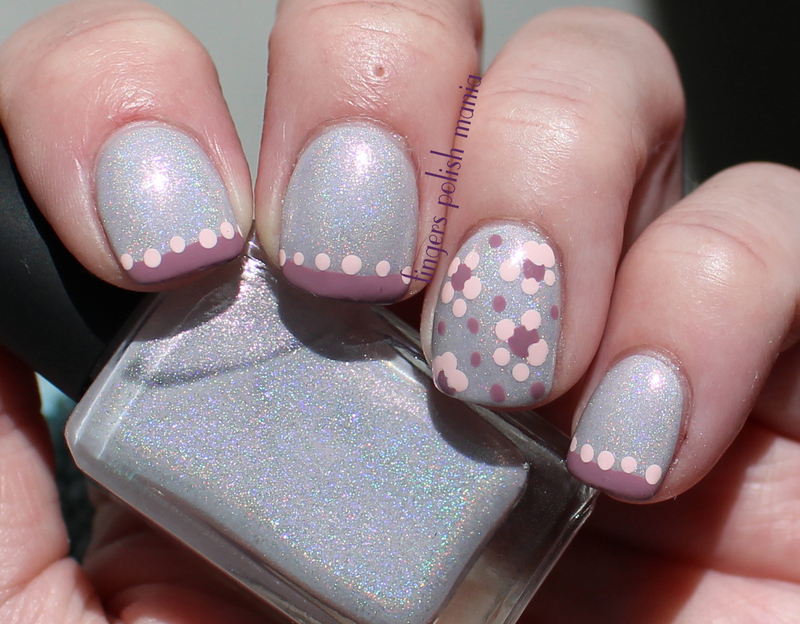 This is Enchanted Polish April 2015, Bettina Ambrosia and Mundo Pink. I started with all April. For the first time in forever-I have outdoor sun pictures! I have to say I am in love with this polish. April is my birthday month and I am happy with this color choice. Next I did my funky and some dot flowers. They sort of need work, but man did people on Instagram love this one! Pretty cool eh? Someone commented on my IG post-asking if I was in love as I did pink and flowers. No people, not in love, just once in a while, I feel the need to be girly and do some pink. Now back under the rock I go.